E. and I had such a spectacular experience at Dragon*Con, we have now made it our mission to go to as many cons as possible. We both have kids, jobs, and you know, just general responsibilities. So, there is some planning and reality involved. We’re Florida gals, and the word in Artist Alley is that MegaCon has a prominent comic book presence. Thus the next con we will attend is MegaCon in Orlando. It is well known that one of the great joys of cons is the cosplay. I have decided that for MegaCon, I will be donning a costume. Black Canary has long been a favorite of mine. 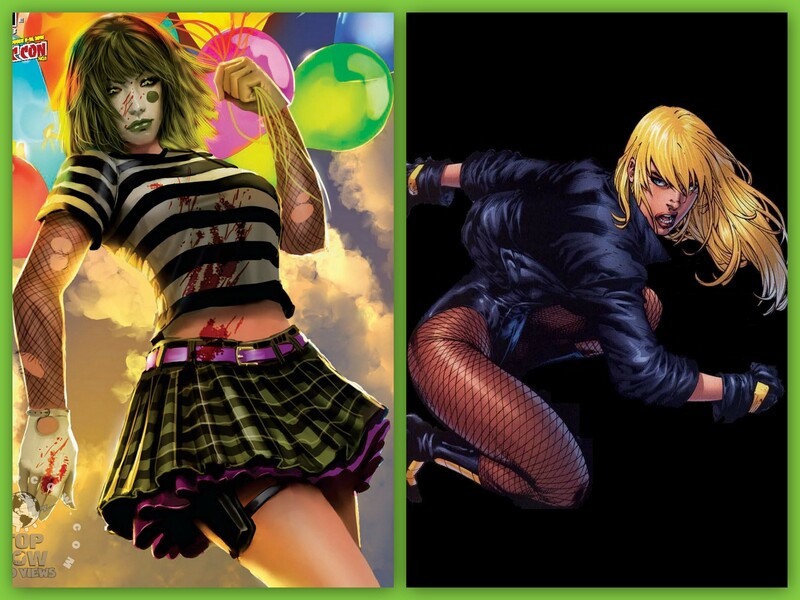 I’ve always said if I ever dress up, it would be as Gail Simone and Ed Benes’ Black Canary. But recently, I’ve sort of fallen in love with the design of Aphrodite IV that appeared in Artifacts #1. So now I am torn, and I need a little help deciding. I concur, Gail. She was born to play the role! While I love Black Canary, especially the look pioneered by Gail and Ed, I think you’d make a rockin’ Aphrodite. It’s a bit more obscure, so you might get noticed more also. You could always compromise. One for MegaCon, one for DragonCon. Just a suggestion! I like the suggestion one for MegaCon … one for Dragon*Con. Look, I don’t understand why you have to choose. There is more than one day at a con. Do both. Do it. Do it. …. Do it. I may be a little biased, but Aphrodite IV hands down! And Ron Marz will be there at MegaCon. YAY! Ron Marz will be at MegaCon! But seriously…If I am not too late to chime in on the decision, this would be a lot easier if we had YOU to decide. I say, get both costumes, take pictures of you in both and then let us decide! I have decided to cosplay The Canary. Yes, yes, it was the only sane decision… pics, m’dear, that’s what I’m getting at! Is the process not that far along? Will you not be filling the stockings for Xmas? Still working on the costume. It won’t be ready until late March. But, there will, OF COURSE, be pictures. Ah… splendid! I’ve only to make it to April, then, and I can die happy… thank you! You realise we autistic sorts are like Terminators… we excel at obsessive, single-minded pursuit of the objective! You should have known that I’d be back… any progress to report? Has modesty kicked in, and you decided you couldn’t wear the costume? Or is it to be via pay-per-view website only? Oh, and could you make one in my size? Er, that last bit was a gag. No, it really was! Don’t give me that look! You should also come to MechaCon in New Orleans one year. Even though it is an Anime Con we still welcome comic cosplay. Last year we had four Harley Quinns, a Poison Ivy, a Catwoman (She was fun to do a little improve scene with), a Batman or two and several more. I even believe I saw a Lex Luthar. XD But yah. I agree with the masses, Black Canary. I will be Black Canary this year at Dragon*Con. Costume is all set.